M.Sc or equivalent degree/ Integrated BS-MS/BS-4 years/BE/BTech/BPharma/MBBS with at least 55% marks for General (UR) and OBC candidates and 50% for SC/ST, Persons with Disability (PwD) candidates. B.Sc(Hons) or equivalent degree holders or students enrolled in Integrated MS-PhD program with at least 55% marks for General (UR) and OBC candidates; 50% marks for SC/ST, Persons with disability (PwD) candidates are also eligible to apply. Candidates with bachelor’s degree will be eligible for CSIR fellowship only after getting registered/enrolled for PhD/Integrated PhD program within the validity period of two years. CSIR will hold the Joint CSIR-UGC Test Tentatively on Sunday 17th June, 2018 for determining the eligibility of the Indian National candidates for the award of Junior Research Fellowships (JRF) NET and for determining eligibility for appointment of Lecturers (NET) in certain subject areas falling under the faculty of Science & Technology. The award of Junior Research Fellowship (NET) to the successful eligible candidates will depend on their finding admission/placement in a university/ national laboratory/ institution of higher learning and research, as applicable. Two separate merit lists, one comprising of the candidates qualifying for the award of Junior Research Fellowship (JRF - NET) and the second, of those candidates qualifying the Eligibility Test for Lectureship (NET), will be made on the basis of their performance in the above Test. Candidates qualifying for JRF (NET), will also be eligible for Lectureship (NET) subject to fulfilling the eligibility criteria laid down by UGC. The candidates qualifying for Lectureship will be eligible for recruitment as Lecturers as well as for Junior Research Fellowship in a Scheme/Project, if otherwise suitable. However, they will not be eligible for Regular JRF-NET Fellowship. 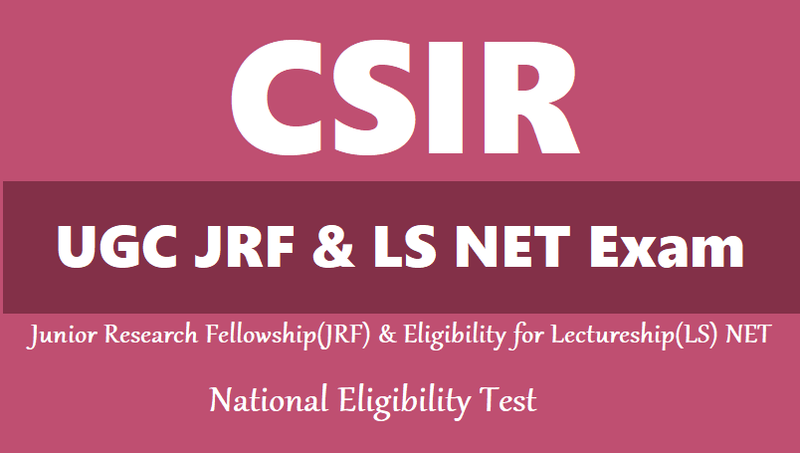 Candidates qualifying for the award of JRF (NET) will receive fellowship either from CSIR or UGC as per their assignment or from the Schemes with which they may find association. The candidates declared eligible for Junior Research Fellowship under UGC scheme and Lectureship will be governed by UGC rules/regulations in this regard.